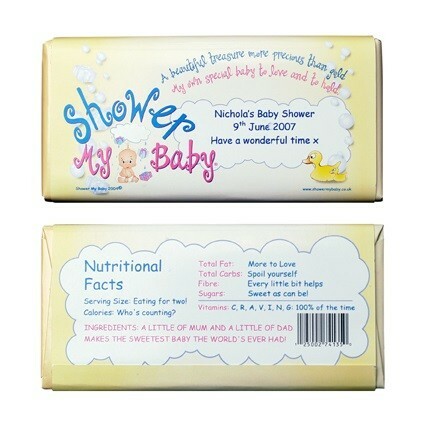 Chocolate Bar Personalised Wrapper © are professionally printed wrappers with your special message. Chocolate Bar Personalised Wrapper © at Just 99p EACH with an adhesive strip attached to stick & fit around a wrapped 100g bar of chocolate such Green & Black's, Nestle Swiss Truffle, Milky Bar etc. Professionally Printed Wrappers with your special message. These will be loved by everyone. We now have these available printed with our very cute Ethnic baby. Please select below. Very simple to wrap around and stick. Each wrapper is made from a quality gloss paper with a space for us to put your personalisation into. If you prefer for this to be left blank for your own special message then please add this into the comments box below. On the reverse of the wrapper is a list of fun & light hearted ingredients to amuse all your guests!! These lovely wrappers are ideal for game prizes, individual guest favours or to add to Mum's Baby Shower gift - Simply wrap around her favourite chocolate bar and personalise this with a special message from you. Designed by & Unique to Shower My Baby©. Something very special for your Baby Shower Party. Please would you also select the colour of ink you would like your personalised message in below - pink, blue, yellow, green, orange, black or lilac. If you have a specific colour request please state this in the comments box at checkout. We loved Leanne's Personalisation - 'Eat me - You know you want to!! Leanne's Baby Shower 12th July 2007.